You could say my husband Ted, at times, is a Christian fatalist. Oh, not the type who eventually goes agnostic, as one writer asserts can happen, but the happy sort. The kind who insists that his Type-A prone bride anticipate something will inevitably go wrong at their wedding…and does it all with a smile and a no-big-deal shrug. If you think I’m joking, let’s rewind a little over 11 years and pretend you’re a fly on the wall. Here’s what you would have heard. Cake? Um … anyone know where the cake is? That’s right, it was MIA. Fortunately, for us, we choose a bakery around the corner and across the street from our church. So Ted hit the pavement in his tux to see what the delay was. You could say he was more than a little shocked to discover the bakery was closed. As in door locked and lights out. Yeah, not a good sign. So he did what any other groom on their wedding day might do. Panic? Not exactly. But he did knock and knock and knock. And who should finally appear? That’s right, someone from the back room. Unfortunately, that someone was not busy putting the finishing touches on our cake. Neither were they boxing it up for delivery. Why? Well, because they’d forgotten to make it. Ted returned to the church with the promise that in three hours, we’d have a cake. He also faced the task of dispatching a messenger to inform me that our previous conversation was no longer hypothetical. Our bakery had indeed forgotten to make our cake. And, yes, there was a chance they wouldn’t get one to us in time. Be relieved to know that I did not kill the messenger when the news reached my ears. Amazingly, I took it fairly well. Probably because my fatalist future husband had prepared me for it. I may have even laughed at the absurdity of what now appeared to be a self-fulfilling prophecy. This expected case of the absent cake taught me a valuable lesson; one I carry with me today. I discovered that flexibility–or the ability to go with the flow when things don’t go as planned–is a great asset in marriage. Not just on the all-important wedding day, but in the hour by hour of life ever after. Now I may, at times, label Ted a happy Christian fatalist. But the truth is the flexibility he encouraged that day isn’t the same thing as fatalism, at least not according to its traditional definition. It’s not a que sera, sera mentality; a “whatever will be, will be” outlook on life. It’s not a defeated Eeyore-esque resignation. Rather, it’s a resolution that when our best-laid plans go awry, we know that a Sovereign God has our back. That He is in control and cares more than we do how our life narrative plays out. And His plans? Even though we don’t understand them at times, they are always way better than ours. 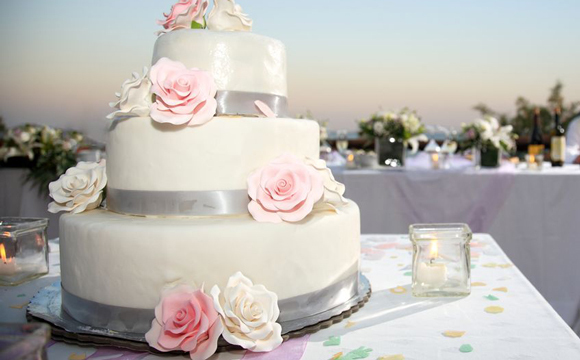 On our wedding day, I could have easily let the missing cake affect my attitude. Ted could have too. If we’d chosen not to laugh at it, but instead to stress over it, our wedding day would have been marked with tension and negativity. But it wasn’t. So did a cake make it to our reception in time? Yes. And, you know what? I think we may have had the freshest wedding cake ever.